A public adjuster is an insurance expert who is employed exclusively by a business or personal policy holder who has sustained an insured loss. Public adjusters handle every aspect of the claim and work closely with the insured to provide the most equitable and prompt settlement possible. A public adjuster inspects the loss site immediately, analyzes the damages, assembles data supporting the claim, reviews the insured's coverages, determines current replacement costs and negotiates with the insurance company. One of the best in the business is Richard Michaelson. He is a liscenced public adjuster in multiple states and is a sought after speaker on the topic. As a service to my clients I was able to garner some time from Rich and have him stop in Champaign on his way to the SEC conference in Las Vegas where he is to be a keynote speaker for the convention. In just the short time we had together Rich was able to share some very informative and extremely valuable information about how to deal with the myriad of insurance issues that we all face. 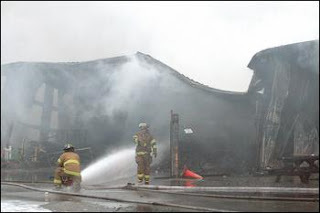 Public Adjusters work for the commercial or residental property owner, not the insurance company. The highly stressful period following a loss is a difficult time for individuals and businesses. A professional public adjuster can reduce those major headaches, allowing you to get back to what is really important. Public Adjusters negotiate insurance settlements for the benefit and protection of the policy holder. Your insurance company has an adjuster representing them and their interests and so should you! A Public Adjuster can re-examine, re-open and negotiate settled claims for additional money. We had a great turn out in the second presentation in our CLIENT SERIES with Rich Michaelson. Stay tuned for new and continuing presentations for our clients. I came away fron your seminar with 5 ways to improve my insurance policy and save money - Thanks!